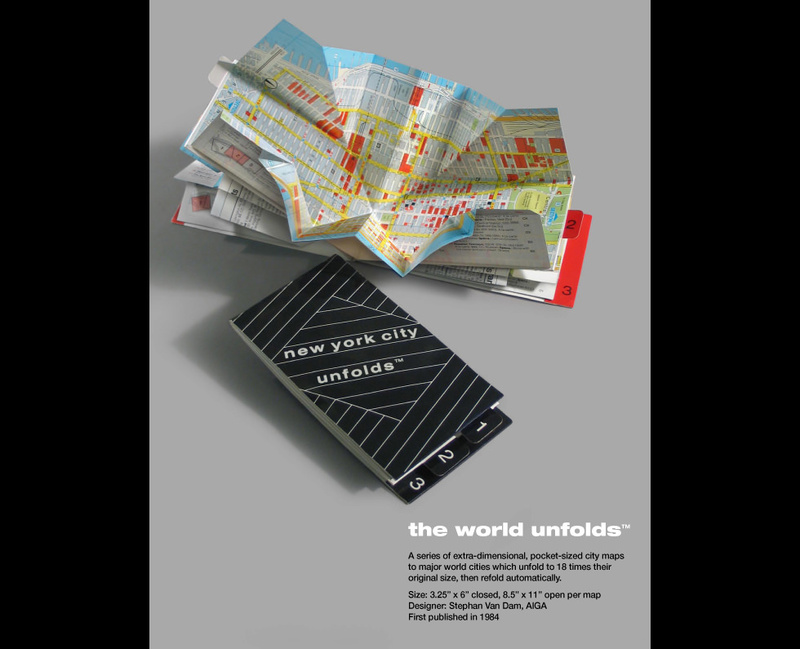 A quarter century ago, Stephan Van Dam’s first origami-like “Unfolds” maps of the great world cities drew critical and consumer acclaim for their playful ingenuity, ease of use and clarity of information design. Now, more than two dozen of those maps – dating from 1984 to 2008 -- including New York, London, Paris, and Tokyo – have been chosen by The Museum of Modern Art for its design collection. 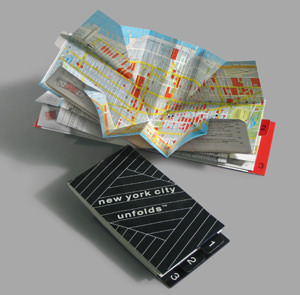 The original Unfolds series of pop-up maps – 3 parts for each city – unfold to 18 times their original size, then re-fold automatically. These 26 Van Dam maps chosen by MoMA join the only other working map in their collection: Massimo Vignelli’s angular abstraction of the New York subway from 1972. 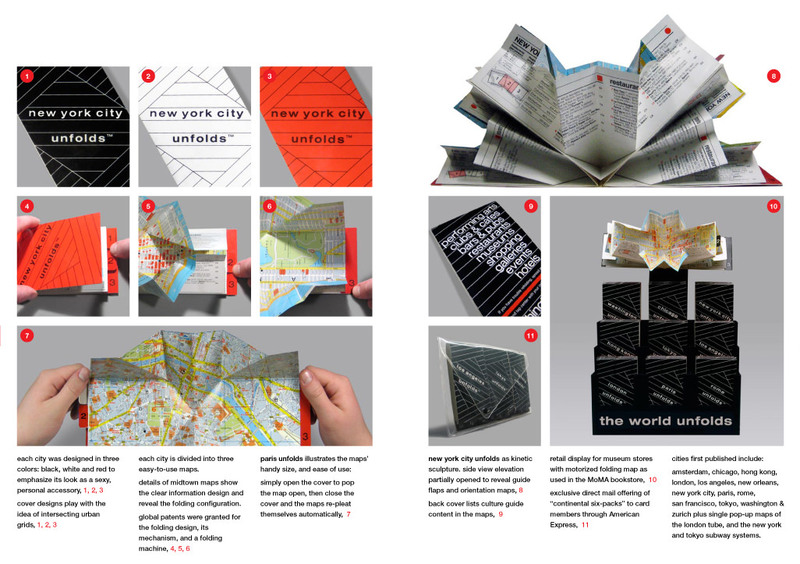 Van Dam publishes maps and guides to 85 global cities in a variety of formats which are sold in airports and drugstores, supermarkets and museums proving that good design sells everywhere. Stephan Van Dam has a passion for the play value of maps. A breathtaking range of projects makes this enthusiasm tangible. From trilingual maps to Beijing and Shanghai to mapping the heavens in Disney’s Epcot Sky Calendar. From creating the first extra-dimensional cover for Marvel Comics to mapping religious freedom in Queens. From designing off-beat drives to launch BMW’s mini to creating a NYC culture guide to honor the U.N’s 50th anniversary. 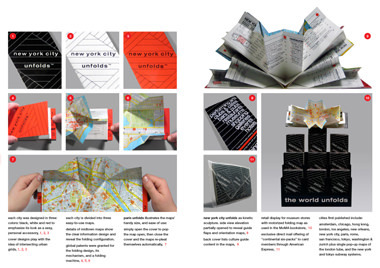 From creating a way-finding and information design system to promote cultural tourism for Heritage Trails in Lower Manhattan to helping Pfizer guide physicians during conventions, VanDam’s passion for maps shows at every turn. Following September 11, 2001 Van Dam was commissioned by the Regional Planning Association (RPA) to create an animated 8.5 min. film to articulate a new vision for New York's public transportation, to build a consensus for that project and to serve as a fundraising tool (link). Fifteen hundred DVD copies of the film were distributed to key policy makers and politicians and it was shown on CNN worldwide. Van Dam’s efforts were crowned by success when Congress approved $4.5 billion dollars in new public transportation funding for the project. WHAT’S NEW? MAKING PEOPLE PART OF THE MAP IN 4D..! Continuing with the playful and interactive nature of cartographic design Van Dam now is preparing to launch his latest advance in the art and technology of mapmaking -- 4-D interactive mapping architecture which makes the user “part of the map in cartographic space.” These new maps will be available for mobile and gaming devices as well as iPhones later this year. In a presentation at TED (Technology/Entertainment/Design) Conference, he began thinking about how technology could immerse the user into the experience of the map itself. Now he is ready to unveil the result of his tinkering.
" we are creating a whole new reality of interacting with the map in 4 dimensions...!!! 4Dmap makes a huge leap by immersing the user into the map and bridging the gap between the abstract and the concrete. Please contact Gail Pellett for any additional information or image requests.